Knee length petticoat for a bit of fluff (and coverage) underneath your costume. 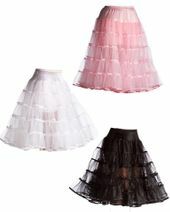 Especially perfect for 50's poodle skirts to help them stand out more! 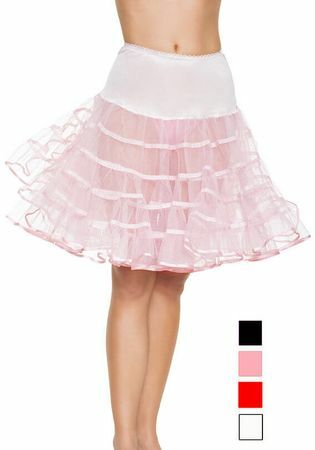 Sheer petticoat with matching ribbon trim and elastic waist. Pink, red, white, or black. One size adult fits S to XL. 22 inches long. By Leg Avenue. Pair it with 50's, storybook and french maid costumes.